European Central Bank president Mario Draghi wants a clearer picture of price trends before acting again on the economy. The European Central Bank dropped the heaviest of hints Thursday that it could cut interest rates or adopt more radical measures next month to stimulate the economy. ECB president Mario Draghi said the central bank was unhappy with eurozone price trends but wanted to wait for updated forecasts in June. 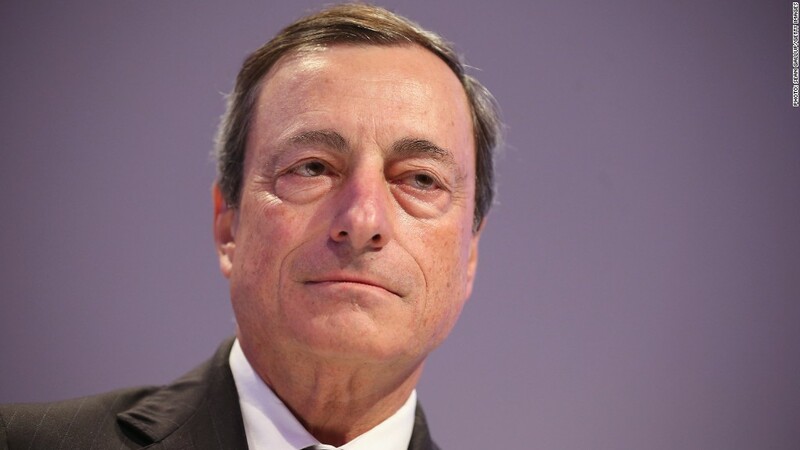 "The [ECB] governing council is comfortable with acting next time, but before, we want to see the staff projections that come out in early June," Draghi told reporters after the the central bank shrugged off calls for immediate action to reduce the risks of very low inflation. The International Monetary Fund and the Organisation for Economic Co-operation and Development are worried that a prolonged period of very low inflation in Europe could suppress demand and job creation, causing a slowdown in the the recovery. Draghi said last month that the bank stood ready to cut rates -- even into negative territory -- or print money through a program of Fed-style asset purchases if necessary. The main rate has been at a record low of 0.25% since November, the last time rates were cut. Inflation fell to 0.5% in March, before recovering slightly to 0.7% in April. That is still way below the ECB's medium term target of just below 2%. Recent data suggest that the eurozone recovery is gaining traction but there are still several clouds on the horizon. Unemployment remains stuck just below its record level of 12%, sapping consumer demand. The euro is trading near its recent peak above $1.39, making life harder for European exporters and exerting more downward pressure on prices as imports become cheaper. Draghi said the strength of the euro was causing "serious concern" given the low inflation across the 18-nation eurozone. The euro, which rose on the ECB statement, plunged after Draghi's remarks. "What we heard today strongly reinforces our prior view that the ECB will ease policy at June's meeting, with the new inflation projections a key trigger for action," noted Ken Wattret, chief European economist at BNP Paribas. To make matters worse, there are early signs that the meltdown in Russia's economy is starting to hurt some of Europe's big companies. Any escalation in the conflict in eastern Ukraine could hit business and household confidence. Draghi said the crisis contained significant risks for Europe, and the region would feel the impact more than other parts of the world if it escalates.